The DeltaWing has crashed again, this time testing for the American Le Mans Series. This is a damn shame, and we'll explain why. Recently, the ALMS approved the Deltawing to race as a classified car for the 2013 season. 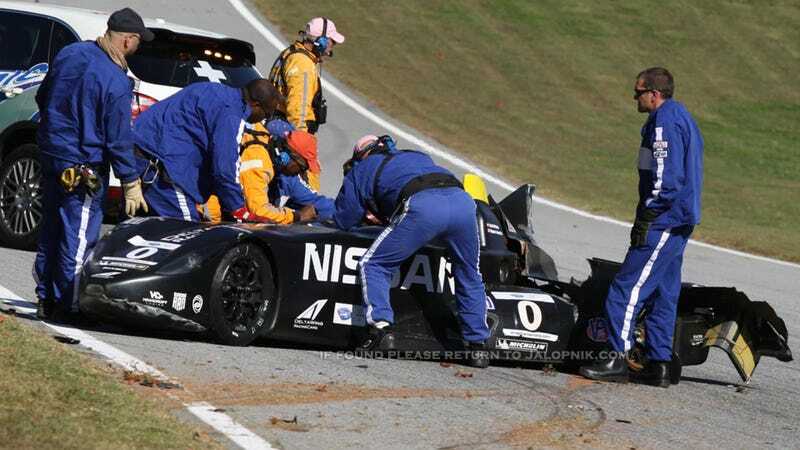 Riding high on this news, the DeltaWing entered into ALMS testing at Road Atlanta and recorded a 1:13.686 lap. That was the fifth fastest time of the field, putting the car ahead of all but two LMP2 cars and half the LMP1 field. That is seriously impressive or a car that was rejected time and again from any kind of competition. Just after recording that P5 overall time, the car went off at turn 11 with Gunnar Jeanette at the wheel. The car was hit by a GTC Porsche. The DeltaWing got upside down, but Jeanette is okay, according to Highcroft Racing. You can see the aftermath in these photos from Track9's Trevor Andrusko. It is a shame to see the DeltaWing crash out after it was tearfully knocked out of the 24 Hours of Le Mans this year. We will update the story as we learn if the car can be repaired for Petit Le Mans this weekend, but it does not appear to be getting back on track any time soon. (UPDATE) HighCroft Racing claims they will be back on track tomorrow. They do have a spare tub, but it does not appear that they will be using it. (UPDATE 2) Gunnar Jeanette has now explained how the crash happened. He was passing another car (a GTC Porsche) going into a turn. As the two approached the corner, the Porsche moved over into the DeltaWing, as if he just didn't see the car's unusually narrow front end. This is almost exactly how the car was knocked out of Le Mans. Jeanette was in good spirits, however, joking "I've always wanted to be a test pilot, just not in a racecar."